Wed. Feb. 5: Koh Samui. Happy Chinese New Year! Yesterday was New Year's Day, and we heard lots of fireworks the day before, on the 3rd. (Starting at 7am!!) Stayed at Karon Thurs., Fri., & Sat. nights, then went to Surat Thani ("Sooraht Tahny") Sun. We were all ready to leave Phuket--guess we got spoiled after Phi Phi, it seems to be the best so far. I think Koh Pha Ngan ("Pahn Gahn") is supposed to be similar. Took a 5-6 hour bus to Surat Thani for 180B, which included a bus from the beach to Phuket town, and was probably overpriced. It was a long ride, with most of the time spent in the oncoming traffic's lane. Fri. Feb. 7: Koh Samui. Spent the night at the Ratchathani Hotel in Surat Thani. Got a room for 350B for all 6 of us--it had 3 beds. Could have gone on to Koh Samui, but decided it was better to arrive there earlier. The best time to find a bungalow is from 8-10 am when people are checking out. Surat Thani is another unexciting city--not much to see tourist-wise--most farangs (tourists) go straight to Samui. Took the ferry to Koh Samui Mon. morning. We took a 1 hr. bus to Don Sak first to shorten the boat time to 1 1/4 hrs. It was a big vehicle ferry, so no problems with sea-sickness. A guy in Surat Thani (at the travel agency) came across also, and drove us around several bungalow places for 50B each. Went to Lamai ("La-MY") beach first, but had trouble 'cause there are 6 of us. Robert & Åsa have a lot more money to spend, and even Per & Ulrika are spending more now that they're close to going home. I suppose that's one of the main differences between traveling with a pre-set return date vs. traveling open-ended. Ended up going on to Chaweng ("Chah-WANG") beach. Robert & Åsa got a room for 750, Per & Ulrika got one for 400, and K & I found one for 250 at the top of the beach, at Samui Island Resort. Very nice, but a little far from things. We're ready to end the month-long vacation at the beaches and return to the trip. This is a little difficult 'cause we've been thinking a lot about home since the other 4 are going home and are talking about it a lot. The 4 of them were amazed to learn that we all had started the trip with about the same amount of money, and they were going for 5 1/2 months, while we were aiming for 10-12! I guess I haven't mentioned our total trip cost yet. We saved about $32,000 total. We set aside $4,000 for when we get home, and paid for our wedding (Aug. 10th) and a lot of other things like storage for our stuff, and medical insurance, etc. The Around-the-World tickets cost about $3600 each, and we spent $400 each for travel passes for New Zealand. That leaves about $7,000 each for all expenses during the trip, including food, housing, entertainment, and ground transportation. We're planning to spend another $1,000 each for Eurail passes to last 3 months when we get to Europe. It does sound pretty impossible, but it certainly is not. We've booked train tickets to Bangkok for tomorrow (Sat.) night, and will arrive there Sun. morning. We're planning to go to N. Thailand for a while, and try to be back in Bangkok by the 16th or 17th, since Per & Ulrika leave very late the night of the 18th. It's understood though that we may not see them again until we get to Sweden. We all still have big plans for when we see them in Sweden this summer. Since this is our last full day on the beach for a while, I feel compelled to write some kind of summary about the beaches. The temp. is usually around 90 degrees F (32 degrees C) or a little higher during the day, so a fan is pretty necessary. Nights are no problem since it's usually very comfortable. We use mosquito repellent at night--some places are worse than others--but all the restaurants are outdoors, and we usually sit outside and talk after dinner. It's really nice having the nets. We bought 2 twin-bed-sized nets in Adelaide, and a double-bed net in Penang. Most of the hotels in Asia have double beds, but most of the hostels in Aust. have twin bunk beds. We bought mosquito coils (like incense) that we use outside at night. Not as much of a hassle as it sounds, and it's smart since we're heading into malarius areas soon. We've been drinking bottled water since we left Aust., and using it exclusively for things like brushing our teeth since we got to Thailand. Bottled water (in plastic bottles) is everywhere, and we usually buy it from the restaurant menu for 10B a litre. I think for a trip like ours you should see everything you can. But if I were to come back, I'd probably go to Krabi and see a couple of beaches, then spend a lot of time on Phi Phi and do a lot of snorkeling and diving. (1,000B / $40 for 2 boat dives and lunch, with all equipment.) I'd skip Phuket and Samui, and maybe go to Koh Pha Ngan and possibly Koh Tao, which is very remote but supposed to be nice. It's supposed to have the best diving in this area, but it's a long way out by boat. Samui is kind of a disappointment, although I had a feeling it was like this. It's probably the most popular beach (island), even though it's not quite as touristy as Phuket. But the beaches are packed with people, and the bungalows are too close to the beach. The biggest surprise is that there are tar balls washed up on the beach that get on your shoes and feet. Sandals (flip flops) are a must for living at any beach, and I bought a pair in Krabi. Sun. Feb. 9: Bangkok. Took the night train Sat.--we had one lower and one upper berth. But someone left food in the upper one, so it was full of ants. So we both slept in the lower one, which was barely big enough for one of us, and definitely not long enough for me. But we survived as usual, and even got a few hours sleep. We had the non-A/C car with a fan, and it was fine, especially after dark. Food was ok, (relative to what we've gotten used to already) but I'm glad we brought a few snacks and something for breakfast. Arrived at 6 am, got off, and waited about a half hour 'til the sun came up. Decided to stay near the train station since we're leaving after one night. We walked about 15 min. to a guest house which was full, and then rode in a tuk tuk ("took took") to the "New Empire Hotel" which was nearby. A "tuk tuk" is a kind of cheap (and usually exciting) form of three-wheeled taxi. It's a motorcycle with a small car built around it, which means you feel like you're racing through traffic, being driven by a madman. But it's cheap, easier than the bus for short distances, and of course, fast. Paid 330B (US$13) for a nice A/C room. Finally got our mail we'd been waiting so long for. After checking the G's, C's, K's, and R's we had 20 pieces (we found 2 in the R's). The Poste Restante system here is pretty funny actually. You go to the counter and show the person your name on your passport. Hopefully he'll be able to figure out which name (first or last) to use. Then he hands you 2 or 3 stacks of envelopes rubber-banded together. Then you go sit down at a long table where about 10 other backpackers are all sorting through envelopes, hoping that the next one will have their name on it. The sounds at the Poste Restante counter are always the same. "I got one!" --"I got another one!" --"I didn't get any!" --"I'm not writing them another letter 'til I get one from them first!" It's universal I guess. Got several letters (and pictures--some from rolls we'd sent home) from our families. Some of it was Christmas stuff that took a month to get to Hong Kong, where it was forwarded to Bangkok. Kathey got a letter that her friend started writing in November, mailed in January, and we picked up in Feb.! I also got 2 great letters from friends--Ana and Sheryl. Took K's braids out today after one month. We spent 3 hours doing it! She had about twice as much hair because half of it was dead hair that usually would have fallen out. So there was hair everywhere! Took the bus for 3B each to the Sian ("Syan") Square area. After a month on the beach, it was really nice to see shopping centers, McDonald's, Burger King, KFC, etc. We had heard so many terrible things about Bangkok that it was a nice surprise to find that it wasn't that bad. Lots of traffic, like all big cities. Sat. Feb. 15: "On the train from Chiang Mai ("Chang My") to Bangkok". Mon. we took the night train (13 hrs.) to Chiang Mai. No major problems--amazing! Ate dinner before leaving, and took snacks for breakfast. It was actually an enjoyable trip. A tuk tuk driver took us to "SK House", which was on the Lonely Planet map, but not written about. That's a shame because it's a great place! 80B gets you a room with fan and bathroom. We paid 120B (US$4.80) and got the same but a little nicer. The food is great and cheap, and the people are the friendliest Thais we've met. After reading so many good comments in the guest book from previous travelers, we decided to go trekking the next day. This place has got to be the best guest house and trekking center in Chiang Mai! The three guides' names are "A", "O", and "Noi". We paid 1400B (US$56) each for the trek. The next 3 days and 2 nights were incredible. Started Wed. (the 12th) at 10 am with a truck ride south of Chiang Mai. Stopped to get tons of food, which one of the Thai guys carried all over the mountain with us (wearing flip flops no less!) There were 5 of us, plus "A", our ever-smiling guide. Two Japanese girls, Keiko and Yuko (sisters), and a German girl, Angela. Had lunch, and went on a 1 1/2 hour elephant ride. Then began the hiking. The next 2 hours and 4 miles were tough. The ground was hardly ever level. Going downhill was just as tough as uphill. At one point we looked out over a valley with a huge mountain on the other side and the guide said ,"We're going to the top of that tomorrow." We said, "oh." Finally got to a village. There are several hill tribes, and this one was the Meo ("Mayo") tribe. They lead an extremely simple life. Kind of felt like being on a farm in the 1800's, in the mountains. Lots of cows, pigs, chickens, and dogs running around. They are all very friendly, especially the kids. Our guide cooked great food, and always had tea and coffee ready. It was really cold at night, but we were among the few that had sleeping bags. They were great--first time in cold weather. Everyone else was piling on blankets, and still freezing all night. Day 2: got up early, had a big breakfast, and started walking. This day made the first day seem easy! 8 1/2 miles up and down huge, steep hills. Walked from 10 am to 1 pm to a waterfall, where we took showers in ice cold water. But we were so hot and exhausted we didn't care. Had a hot lunch, and rested 'til 3:45. Then started walking again, and ended up in a "Karen" village by 5:30, feeling like we were about to collapse. Another group from "SK" met us there, and we finished the trek with them--three Canadians, one Swiss, and one American. Had another great meal, and sat around the fire as it got colder and colder. Northern Thailand is famous for poppy fields, and an opium pipe was available for anyone interested. This village had 170 people, the first had 120. Great views looking out from the top of the mountain (we did go to the top). Day 3 started with a 2 hr. hike through another village and some beautiful scenery. Some parts were dirt roads, but most were the jungle/woods like before--none of it was level of course. We were met by our truck, which we hadn't seen in what felt like a week. Had lunch, and drove to the rafting camp. We all got on bamboo rafts and rode for about 1 1/2 hrs down the river. Each raft had a Thai guide with a bamboo pole at the front, and we took turns using a pole at the back. Had a great time! Had water fights, and raced down the river, avoiding all the rocks. (of course, our raft with the 3 Americans came in 1st!) A great way to end the trek. Got back, unpacked all our filthy clothes, and washed all the dirt out of our shoes. SK House brought two "firsts". One was iced tea, which I've been craving since we left 5 months ago today. (In HK I had some with sugar and milk--yuk!) The other was the first hot shower since December 24th in Hong Kong, almost two months ago! Back in HK, I remember a couple of people checking in to the hostel. They had been traveling across Asia for a while and their first and only question was, "Do you have hot showers?" When the owner said yes, they immediately dropped their packs and said, "We'll take it." At the time, I thought that was such a strange question to ask. Now I understand completely. Today we were sore from head to foot, but it was worth it. We'd planned to go to Chiang Rai and look around that area, but we were so tired, and we felt like we'd already seen much more of the "local" life on the trek than we could ever see in Chiang Rai, so we decided to head back to Bangkok on the night train tonight. Wed. Feb. 19: Bangkok. Well, I've changed my mind--I don't like Bangkok. It's basically a much bigger version of either KL or Penang. Either things are getting more difficult or my patience is just running really thin. Chiang Mai was such a nice change that I forgot how difficult and rude the Thais in Bangkok can be. Getting anywhere is a problem here because it's either expensive (taxis & tuk tuks) or it takes forever (buses). We arrived by train Sunday morning. We left our packs at the "left luggage" of the train station for 20B each and headed for the GPO. Got 3 things from my mom. A letter, a Valentine's Day card, and a huge box full of homemade cookies! They arrived in great shape (and delicious). Took the bus up to Khao San ("Cow Sahn") Road to find a room. Everywhere was either too cheap and run down, or full. But then we tried Dan's suggestion, the "Khao San Palace Hotel" and got a nice room with a fan for 350B (US$14). Met up with Per & Ulrika, but Robert & Åsa had already left for Chiang Mai. Took the bus back to get our bags, and brought them up here in a tuk tuk for 50B. It was much easier trying to find a place without the packs. Khao San Road is, as Dan wrote, "Retro 60s land." Absolutely filled with back-packers, all either coming up through Asia like us, or coming from India and Nepal heading East. The sidewalks are just one long row of tables selling food, clothes (fake Levi's, belts, jewelry, shirts), used books, fake student and press ID cards, and tons of pirated cassette tapes. The tapes are only 25B, and they have everything. The quality is a little less, but for one U.S. dollar it's hard to pass it up. (We've seen these all over Asia actually.) The only problem is that Khao San Road is so far from the GPO and big shopping areas like Siam Square. Otherwise it's a good place to stay. We spent a lot of time looking into traveling to Vietnam. Bangkok is definitely the place to do it from. But visas are about US$70, and round trip tickets to Saigon are about US$300. So even though everything is cheap in Vietnam, we calculated that a 10 day trip would cost about $1000 for both of us. The other problem is that the return flight wasn't available for the right dates. I really want to go now, especially since we're already in Bangkok, and I think this may be our only chance, but it just isn't working out on this trip. We've also had trouble with our flight out of India to London. All the British Air flights from Delhi are booked from now 'til April 1st. So after a lot of work we found that we could pay for an Air India flight from Delhi to Bombay, and then fly to London from there. We also found out that a visa for India takes 10 days and costs US$52, from here at least. We seem to have forgotten how to travel during our Thailand vacation, because some of these things should have been taken care of before we went to Chiang Mai. 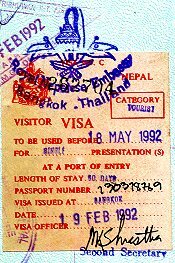 We were able to get our Nepal visas today in 10 minutes by paying 100B extra (normally it's 2 days). 520B (US$21) for a 30 day visa. We finally got a used copy of L.P. West Asia, and we're getting excited about Kathmandu, although trekking may be a problem since K is sick with a cold right now. Yesterday was kind of strange because Per & Ulrika went home after 5 1/2 months. We had dinner, and said goodbye 'til we get to Sweden this summer. As I write this, they've been home for 8 hrs, and I'm thinking how nice it would be to see all of our friends and family, even though I'm not ready to stop traveling yet. As I've said before, homesickness means it's time to get moving again. Right now we're really looking forward to London, which seems much more like home than a foreign city--Asia will do that to you I guess. Sun. Feb. 23: Kathmandu, Nepal. Thurs. we went to the GPO for a last look and got the Lonely Planet Africa book my mom sent. Also mailed a box home with rolls 19-24, some souvenirs, and copies of some of the journal pages and the film descriptions. Fri. we met Robert and Åsa by accident 10 minutes before we got on a minibus to the airport. That's the third time we've met them by accident--Sydney, Krabi, and Bangkok. They had just returned from Chiang Mai and had a few more days before going home. The bus cost only 50B compared to 300 for a taxi--it took 1 hr. plus a half hour for him to pick up everyone. Lots of hassles at the airport. We finally bought the Air India ticket for Delhi-Bombay, and got our around-the-world ticket changed so we could fly Bombay-London instead of from Delhi. The plane eventually left, and we had a great view of the Himalayas sticking up through the clouds as we arrived in Kathmandu. (The book said to sit on the right when coming from Bangkok, the left from India.) Got money exchanged and through customs, and then were mobbed by taxi drivers and hotel people. Taxi rip-offs seem pretty common here and we were no exception. The driver insisted over and over that he take us to his guest house first, then the one we wanted. After demanding several times, we finally made it to the "Holy Lodge", but had to pay twice as much because, "The price was for only one person." It turned out that he had quoted us half the normal price to get us into his cab so he could start the hard sell. I hate arriving in a new country after dark! Well, we are no longer in S.E. Asia. Kathmandu is definitely not another typical Chinese city. Things feel like India here (even though we haven't been there yet.) It's really a strange city. The Holy Lodge Guest House is an old hotel in the northern part of town call "Thamel." We stayed the first night in a room for 150 Rupees (US$3.50), which was the only thing available. It was on the old side, which means no connecting bath and that all the doorways are about 4 1/2 feet tall. (Even Kathey had to duck!) It was a small room with a double bed and a tile floor, and it was very cold. Again our sleeping bags saved us! We could have stayed there to really save money, but decided to move to the new side, with bathrooms. Normal rooms are 440Rs (with tax), but the best room they had was available for 500Rs (US$12), and we took it. It's the only room on the top (4th) floor, and right next to a big balcony which is actually the roof. It's nice to sit up there and look out over the city and the mountains. It's really a great town for exploring on foot. Every street has something new. The only problem is we're constantly getting lost, even with 2 maps and a compass. The streets wind around, and I haven't seen a single street sign yet. Went to the GPO today and got 2 letters from my grandfather and K. got one from a friend. We weren't expecting much here, so it was a nice surprise. Had to go to the Royal Nepal Airlines office to reconfirm our flight to Delhi--a phone call wasn't good enough--and of course the office was chaos. Something tells me we're getting closer to India and all its bureaucracy. The food here is absolutely incredible! Thamel is definitely the place to stay because of all the great restaurants. We've already found several great ones just a couple blocks away. "KC's", "Pumpernickel Bakery", "Narayan's", and our favorite so far, "Helenas". The service is incredibly friendly and fast, and the food is delicious. For breakfast you can have eggs, toast, ham, fried tomato and tea or coffee, for a dollar. For dinner tonight I had a delicious steak, French fries, vegetables, tea, and a piece of great carrot cake for the equivalent of 3 U.S. dollars! The only real problem here is that it's cold, even in our room--a small heater would make this place perfect. Our plan to go trekking here seems to be changed. K is still sick (but in the final stages) and the thought of hiking and sleeping in the mountains is suddenly less appealing now. I think we're generally tired from the last few months. But we're considering going to Pokhara ("PO-ka-ra") for a couple days to see more of the Himalayas--we can't actually see them from here. Mon. Feb. 24: Kathmandu. Went to the Indian embassy this morning and applied for a visa. Only 215 Rs (US$5), we got it back at 5 pm, and no hassles! A miracle! But we only wanted one for 10 days--over 15 requires more money, more hassles (possibly a telex from your country), and up to a 15 day wait! K. wasn't feeling well, but I rented a bike for 2 hrs (40 Rs) and rode to the Swayambhunath temple. A nice 20 min. ride, then a 10 min. climb up stairs to the temple and a great view of the city. This is one of the many temples with the eyes on 4 sides, "watching the valley for righteous behavior." Lots of monkeys running around here also. Machine embroidery is really big in Kathmandu. Lots of shops using modified sewing machines to stitch designs onto shirts and patches. We each had a shirt custom made for 150 Rs. Also had patches custom made for Nepal, and since we never got one for Fiji, we had him make us 2 of those also. Bought bus tickets for Pokhara. We go tomorrow morning. Met a couple from San Diego (Eric and Karen) that are going to India for 2 months. They loaned us the L.P. India book and we looked at the sections on Delhi and Agra--I feel much better about India now. Talked to a British couple that gave us suggestions for Agra and further bad reviews for Delhi. Fri. Feb. 28: Kathmandu. Tues. we took the bus-ride-from-hell to Pokhara. Eight hours of dusty, bumpy, unpaved roads that I thought would have been passable only by four-wheel-drive. When we got there the bus pulled up and a mob of people charged the bus, all holding cards for their hotel and yelling "I take you to my guest house--very cheap, very nice, 50% discount for you today." We got in a taxi with a guy that absolutely promised he would only take us to the "Pilgrim Inn" and nowhere else. He told K. to sit in the front--"special seat"--and he sat in the back with me while the actual taxi driver drove us. We moved about five feet when he started with how expensive our place was and how he had a guest house. Then Kathey got semi-hysterical and screamed at him and let him know he should not waste his time with us, and should get out and try someone else--so he did. At that point we suddenly understood this whole scam. The drivers don't speak English--they just drive. And the "recruiters" do just that, which is why there's always more than one person taking you to the hotel (In Kathmandu we had 3). So the key seems to be to find the guy with the card for the hotel you want, or to try to talk to the driver directly, or maybe just walk. But never get in a taxi with more than one "driver" unless you're sure the recruiter will get a commission for taking you there. And if you do go to their hotel, you should be able to get them to take you for free--as long as you stay there. But agree on a price for if you don't stay. Anyway, the driver took us there and it was nice, right by the lake. It cost 250Rs (US$5.75) with bath and hot shower. Lots of good restaurants in Pokhara also. It's very relaxed compared to Kathmandu, and even the salespeople aren't as pushy and seem to actually understand the word "no". We got to see the Himalayas finally--very pretty and impressive. The lake is big and beautiful--very calm--a lot of people rent canoes. We rented bikes Wed. and rode around and took pictures. Got a good view from the big temple, but it really wasn't worth seeing otherwise. Had a nice relaxing day and a half, then Thurs. we came back on the same bus-ride-from-hell, and it was just as bad. We got smart on the way back and brought lunch food. I can't imagine eating at the places they stopped, and as always in Asia, bring water and toilet paper--the 2 most important things. This morning I found out our flight to Delhi has been canceled due to a pilot strike, but they're putting us on a 7:45 pm flight with Air India (instead of Royal Nepal). My worst fear came true--after 6 months of knowing we had a morning flight to India, it got changed the day before! I can't believe it! I can't wait to get to London!